Select speed (1-low, 2-medium or 3-high). Placing the IN/OUT switch in the center (neutral) position can turn off fan blade. 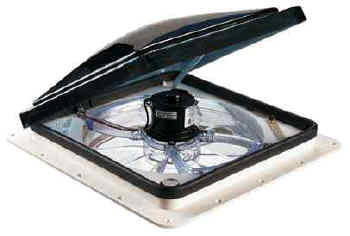 Automatic Dome Opener with Built-In Rain Sensor. This model is activated when the threespeed switch is turned to any of the three speed selections. The dome cover is opened when the dome up switch is activated and closed when the down feature of the switch is selected. To activate the fan blade, the built-in thermostat must be turned to a temperature selection, which is lower (cooler) than the current interior temperature. Once the selected temperature is attained, the fan blade will shut off, but the dome will remain open until the down feature is selected or the built-in rain sensor becomes wet. Once the sensor dries, the dome will re-open. A built-in manual knob can be used to close the dome in an emergency, to adjust the dome to a desired partially open level or to override the rain sensor. For storage, the dome switch must be in the down position and the three-speed switch in the off ("O") position.